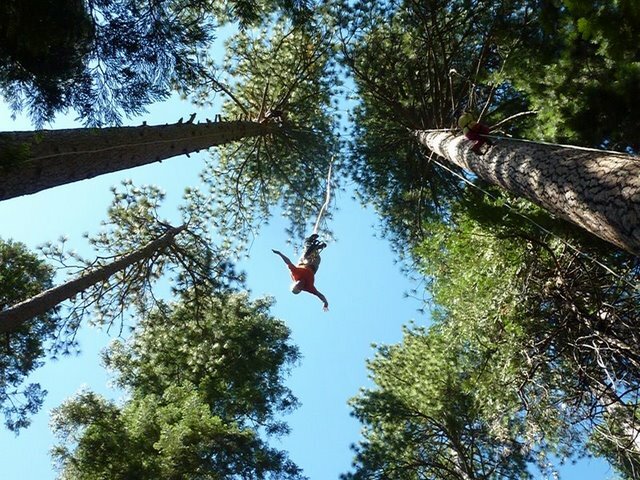 Jump between two giant (200 ft tall) trees in a Redwood Forest. This is three adventures in one. First you climb the trees, second you tight rope walk between two trees (with a hand line for balance), third you jump out of the trees. This is a one of a kind adventure, suitable for first timers but more challenging and higher than the bridge jump. Tree climbing instruction (jumaring up fixed ropes) is included in the cost. Cost is $149 for rope jump. Options include: pictures & video ($19/each or $29 for both), GoPro video ($29). Watch the tree swing video. Watch the tree bungee video.